Liz Spry, the designer behind Bird of Play, constantly comes up with brilliant ideas for novel gifts (or cute things to covet for yourself)! At price points which also make them perfect for gift-giving, you just can't go wrong. 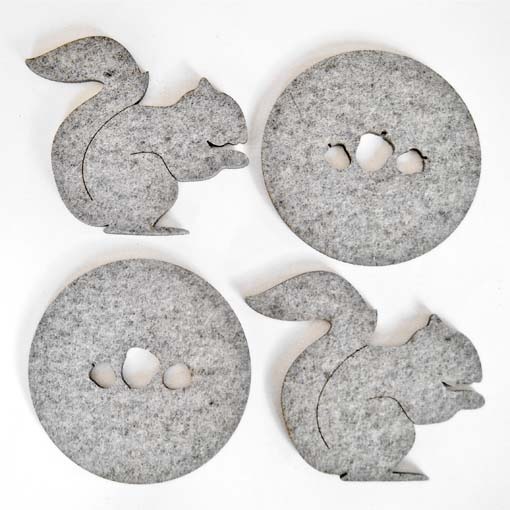 This lovey set of 'nuts about you coasters' includes four coasters: two squirrels, and two sets of acorns. These will add a touch of fun to any table-top. They are water and heat resistant - a perfect resting spot for your cup of tea or coffee. Materials: 100% pure wool felt, with crisp laser-cut edges; luxuriously soft, strong and sturdy. The 'nuts about you' coasters come beautifully packaged in an abirdofplay gift box, perfect for gift-giving - or to treat yourself!